So if you're looking for an amazing exfoliant, you really need to look no further than at Kate Somerville ExfoliKate Intensive Exfoliating Treatment. This is the scrub to end all scrubs, the one that changes your skin for the better and makes you wonder how you ever lived without it. Read on to find out how you can win it today! Pretty incredible, right? Plus, ExfoliKate helps improve the appearance of skin texture, crow's feet, fine lines and wrinkles. If that's not a miracle worker, I don't know what is! I also love how gentle this exfoliant is -- it's not harsh or stripping, and it's perfect for super sensitive skin (like mine!). This product truly is one that everyone should have in their skincare arsenal. And today, one lucky person has the chance to win it! This giveaway has a retail value of $85 and will end on Wednesday, December 14 at midnight EST. To enter, use the Rafflecopter widget below. Good luck! I would like to win this face scrub because I like that it doesnt have harsh chemicals that can harm my skin. I am obsessed with beauty products. I would love this face scrub because my skin needs help! this sounds great! i'd like to win because i've only ever used one face scrub and it would be good to try something new! This is a brand I've always loved! Such a good giveaway! This product is a staple! I am turning 30 this year and really need to up my face care game so I would love to win! 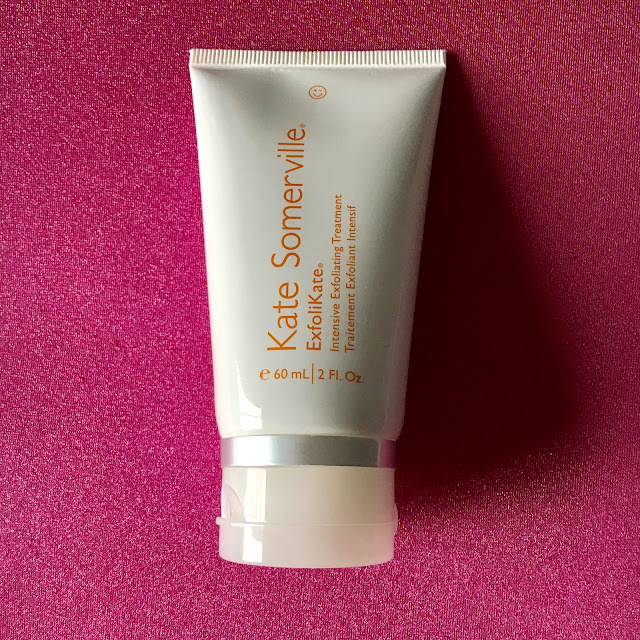 I haven't had a chance to try anything from Kate Somerville yet, but this exfoliator sounds great! Sounds interesting. Need this scrub. Awesome! I've always wanted to try this. I want to win because i would love to try this! I'm 40, but I still have problems with my skin. I think this would be great for my skin! I've tried a sample of this before and would love to be able to use it over a period of time. I have been using ExfoliKate for YEARS, and absolutely LOVE it! This is a fantastic giveaway! Your prizes have been incredible. I think this one is tops! I would love to try their products! I love their exfoliate! It would be great for my skin! I'm turning 61 next month and I'll be needing a miracle! Thank you. I love using face scrubs as part of my shower routine. I'd like to win because I've never tried this face scrub and it's a holy grail item for so many bloggers! My skin is so congested lately. I'm thinking this can help. Wow! This seems great, but it is a bit much for my wallet. I tried this ages ago and loved it but never got around to picking up a full-size! I haven't tried much from this brand, but this sounds like a really great scrub. I believe this is the one product I tried from this brand a few years back. I do remember enjoying it but I think it's still a bit too harsh for my sensitive skin. I did like it though.